Throughout comic book history, typically every few years, all storylines converge into a massive, universe changing crossover event usually encompassing all of a publisher's most popular superhero characters across titles. Marvel Studios' latest team-up movie, Avengers: Infinity War, really takes that shared character universe storytelling concept to heart visualizing it on screen. Thus, Captain America franchise directors Anthony and Joe Russo set out to make this latest Avengers an all-out action spectacle that's both simultaneously exhilarating and emotionally exhausting from start to finish. To be frank, there's simply just too/so much movie here. 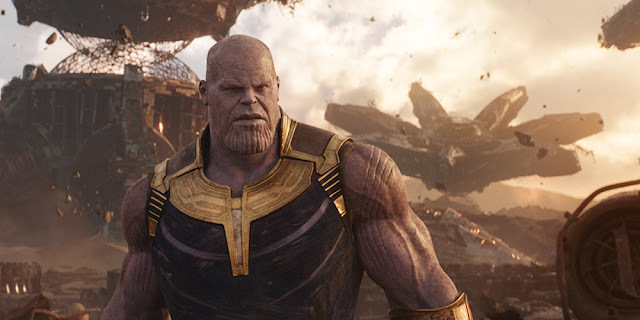 The bombastic Infinity War is completely overstuffed and crowded with so many characters who basically get very little in any development outside of the big baddie Thanos, a very burly and purple Josh Brolin. He finally collects all six of the infinitely all-powerful Infinity Stones to kill half of all life in the universe and restore a twisted sense of cosmic balance. Thanos' motivations are front and centre and give a lot of depth to his adopted daughters, Gomora (Zoë Saldana) and Nebula (Karen Gillan). His characterization as an alien, god-like eco-terrorist obsessed with population and resource control is an interesting encapsulation of galactic villainy. Brolin makes him so much more than the various annoying teases of his behind-the-scenes string pulling so far. As for the rest of the sprawling cast (mostly split up into factions), it was incredibly distracting seeing Robert Downey Jr.'s Iron Man and Benedict Cumberbatch's Doctor Strange facing off as alternate versions of the same character archetype (and matching goatees). Chris Evans' emotional centre takes a while to manifest as Captain America, but he doesn't need much in the way of investment to connect his ideals with audiences while Mark Ruffalo as the Hulk barely shows up in his green form but adds enough welcome humanity to the chaos. The very funny Chris Hemsworth and Chris Pratt comically facing off their comedy chops as Thor and Star-Lord was amusing. However, it's Tom Holland's infectious enthusiasm as a young Spider-Man that really makes us long for his laughably small stakes adventure in comparison to this film's galaxy shattering threat. Dave Bautista's dry humour alongside the rest of the Guardians of the Galaxy crew is another highlight with a wider cast to play off of. 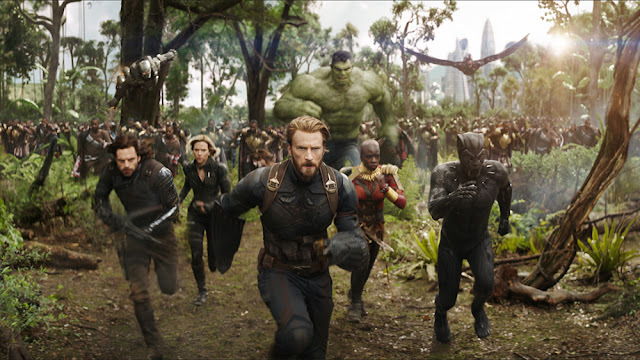 Veteran screenwriters Christopher Markus and Stephen McFeely throw much of the Marvel Cinematic Universe's massive moving parts aside to get right to the dread and action. One of my favourite, albeit somewhat clunky, recurring motifs was characters explaining the events their own standalone adventures to each other and catching up on certain plot points and relationships. The sheer audacity and boldness of some of the epic moments and humour really are admirable even if messily put together. Unfortunately, the film comes right on the heels of the refreshingly self-contained Black Panther and its truly compelling villain Killmonger and a mid-level threat viewers could really get into. Here, there's just so much happening (even off-screen) to really be invested in the mass destruction of incalculable scale. There are barely any non-superhero characters featured to set any real gravitas or ground the titular Infinity War. The ending proves so unsatisfying and sort of trolls audiences and their usual complaints about the lack of finality, true villainy, or the formulaic nature of Marvel films. It's hard to judge that ending and the film on the whole without its accompany second half. Marvel may or may not suitably pay off or redeem the controversial half-resolution, but the sense of unresolvedness is frustrating. Infinity War is a sprawling epic of insane highs and plenty of flaws with its share of problems juggling so many characters and taking on the task of paying off ten years of continuity and the eighteen films that preceded it. Sadly, the Russos essentially invalidate much of the stakes (and many other films' entire plots) by the end of things. As we know, in the comics, world-changing events seldom last and there's surely going to be a reset or undoing in the still untitled fourth Avengers film due out next summer—unless Marvel suddenly decides they hate making money.